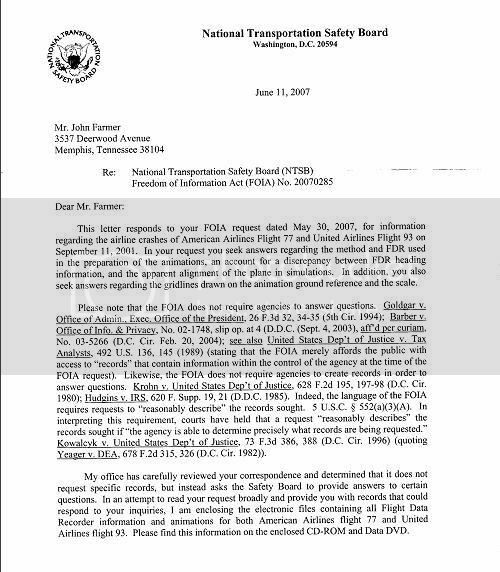 A prominent 9/11 Researcher and colleague of Pilots For 9/11 Truth, John Farmer, submitted a request to the National Transportation Safety Board (NTSB) through the Freedom Of Information Act (FOIA) seeking answers for the various discrepancies within the American Airlines Flight 77 Flight Data Recorder. The NTSB responded in the form of case law as an excuse and precedent to not address the questions raised regarding the information the NTSB provided through the FOIA which does not support the govt story. It is no surpise one case the NTSB sources is a tax case seeking recent federal tax court rulings. Click picture for full article. dicktater on Thu, 06/21/2007 - 10:40am. 911veritas on Thu, 06/21/2007 - 10:57am. You must know exactly what it is that you seek. Leaves them free to deny when it suits them. Lawyers. Wordsmiths who write law to be an inpenetrable maze, undecipherable unless you have passed initiation into their club or stil have a Captain Crunch Decoder Ring. If laws are written so complicated as to be only decipherable by those certified with the Decoder Ring then, those laws should only apply to them. dicktater on Thu, 06/21/2007 - 12:46pm. Sorry guys... i posted the article too fast didnt get the full url. Either way.. you guys got it.. thanks! John Farmer doesnt mind his address shown. The same letter is on his blog as well. He also wrote an appeal to the above... not sure if he posted it on his site yet. Also, keep an eye out for major breaking news, either tonight or tomorrow early morning from David Ray Griffin and myself which will be posted front page. rob balsamo on Thu, 06/21/2007 - 4:15pm. Bureaucrats are supposed to follow the law, so really they are doing the right thing since it takes taxpayer money and time to respond. FOIA requires that records be released. It does not require that agencies answer questions. Should it? Probably, but it does not. Yes, I'm a lawyer, and no, I don't think lawyers should make the law unnecessarily obscure, and yes, some lawyers do that on purpose -- generally the ones representing powerful interests. But you are right about the Catch 22. Maybe they can make a new request based on what they get. Ningen on Thu, 06/21/2007 - 4:45pm. THAT is where you will get your answers. If you haven't already done that, then you need to do some research about FOIA requests and what "legal terms" ('official' and legally binding terms and terminology) you need to use to force them to give you what you want. It's all on the Internet now. doughnut on Fri, 06/22/2007 - 3:30am.